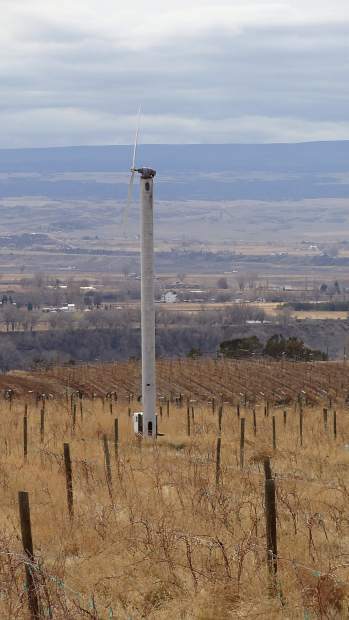 Wind machines will raise the vineyard temperature ten degrees during a frost. Galen Wallace stands by the Plum Creek Vineyard outside of Paonia, Colo. The endless rows of vines have been stripped for winter. 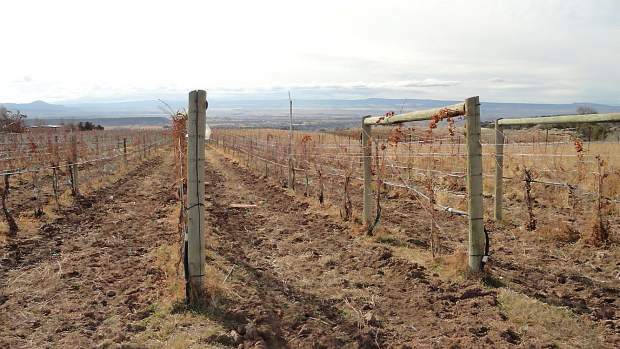 Once uncoiled and stretched in the spring, wire will help hold up the ripened bunches of grapes. Galen removes the excess bark that the grapevines shed each year. 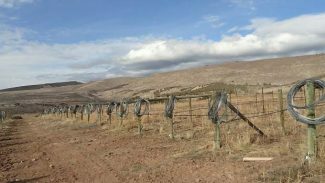 Located at 6000-feet elevation with spectacular views of Mount Lanborn, the top of the Black Canyon, and the distant San Juans, Plum Creek Vineyard on Sunshine Mesa west of Paonia, Colo., is one of the highest in the state. Because there is a constant danger of frost, "We watch temperatures all year," says Galen Wallace, who has been manager since 1990. 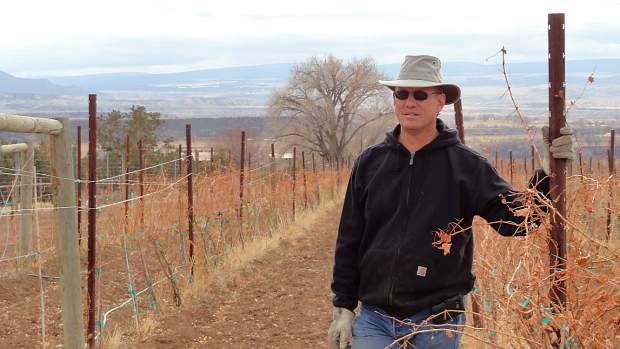 (He's also in charge of two other vineyards in Palisade.) "More than once, I've had to start the wind machines — which raise them 10 degrees — in the middle of the night." Powered by 429 and 510 horsepower engines, they are as noisy as helipads but to the half-dozen residents who live further up the road it's just part of the neighborhood. Since Plum Creek, established in 1984, has an annual output of 9,000-15,000 cases, they've come to expect extra activity every now and then. "I pass out a few bottles of wine afterwards," he adds with a little smile, "and nobody complains." Mostly working alone, Galen drives 110 miles round trip two or three times a week in order to keep track of the vines in both Paonia and Palisade. He's in charge of nearly 45 acres between the two places and is "responsible for EVERYTHING from day-to-day irrigating to fertilizing, cultivating and timing the harvest. Basically, when the grapes are ready (usually around the middle of September) you pick." There are plenty of varieties to take care of since the vineyards produce Chardonnay, Sauvignon Blanc, Gregio and Riesling. And that's just for this area: in Palisade he grows Merlot plus a jet-black, blending-type of grape known as the Petite Verdot in addition to looking after his own, personal 22 acres of grapes and peaches. "The months of November and December aren't too bad," he said while leading the way around neat, endless rows of Sunshine Mesa. "Right now, it's about making sure the plants are healthy and the ground isn't getting drought-stressed. Carbohydrates (which the plants produce) help, since they technically act as an anti-freeze. 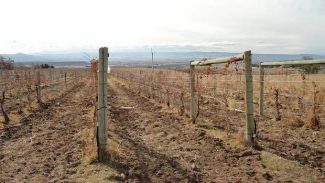 We start winter pruning in late December and I do as much as I can in addition to maybe one seasonal worker per each 10 acres." 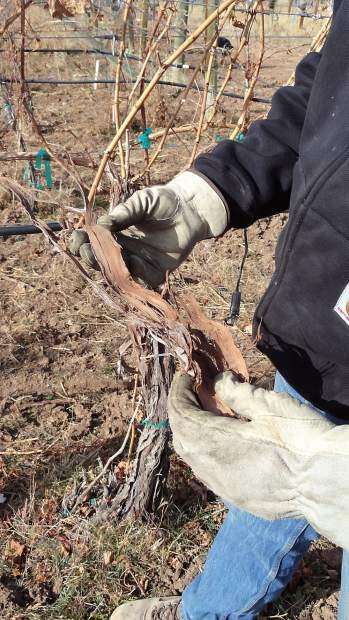 Galen prefers "spur cane" pruning, which involves cutting off the cane used for crop, as opposed to the more popular Cordon method, which allows a trunk to develop after which it is cut back to short chutes. He will also remove the excess bark that grapevines shed each year; lower the wires that help hold up the ripened bunches; pull out and replace anything that is over 20 years old since "older vines don't produce as much"; and roll up the protective bird nets. It's the robins, actually, which cause Galen the most trouble since "they'll peck at the grapes just as they're getting color but are still sour" so the nets are invaluable. As for the worst bug problem, there was the Japanese beetle outbreak in Palisade in 2002. "They were probably brought in from a nursery back east. I was on the committee that eradicated it. We started by getting rid of the Virginia Creeper that they lived on. It took a good five years, with fewer and fewer affected areas each year."